Home / What is Stormwater? 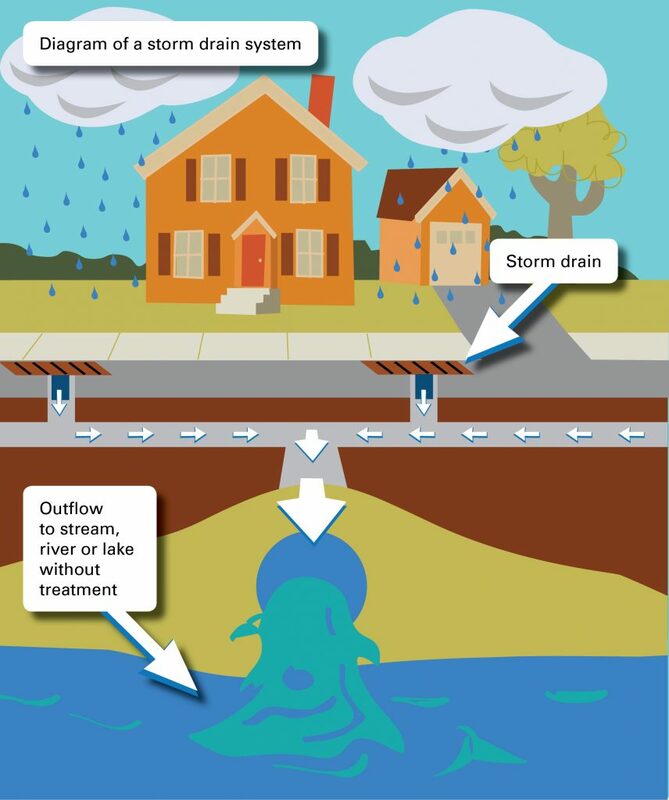 Stormwater pollution begins when rain or snow melt flows over land or hard surfaces and carries pollutants such as bacteria, nutrients, metals, and chemicals into local waterways, affecting the cleanliness and health of the water that we rely on for drinking and recreation. Polluted stormwater often affects drinking water sources, which can affect human health and increase drinking water treatment costs. Sediment that can cloud the water and make it difficult or impossible for aquatic plants to grow. Sediment also can destroy aquatic habitats. Excess nutrients that can cause algae blooms. When algae die, they sink to the bottom and decompose in a process that removes oxygen from the water. Fish and other aquatic organisms can’t exist in water with low dissolved oxygen levels. Bacteria and other pathogens that can wash into swimming areas and create health hazards, often making beach closures necessary. Household hazardous wastes like insecticides, pesticides, paint, solvents, used motor oil, and other auto fluids that can poison aquatic life. Land animals and people can become sick or die from eating diseased fish and shellfish or ingesting polluted water. Polluted stormwater runoff causes more than half of the pollution in our waterways, according to the U.S. Environmental Protection Agency.